This story takes place long before the arrival of white men to Turtle Island. It was a time of scarcity for the indigenous people of this land. There was not enough food, clothing or shelter to go around. Neighboring tribes were constantly battling over what little resources were available. Something had to be done, so the elders called a counsel. As they were discussing possible solutions, one of them spotted a lone figure far in the distance. When the person drew closer, they could see that it was a young woman, clad in a beautiful white robe and carrying a bundle that was also wrapped in some kind of skin. She had an angelic appearance and so they trusted her and were not afraid. She drew them to her side saying, "A time of great abundance is near, but you must learn to work together and tap into the power of the Great Mystery". With those words, she unwrapped the bundle and took out a beautiful pipe. "This is the sacred pipe", she said, filling it with special herbs while saying, "Its smoke will make our earthly prayers visible and deliver them to the heavens". She taught them to give thanks and to combine prayer with proper action to obtain what they needed, reminding them that the fastest way to stop the flow of abundance was to neglect being thankful for blessings already received. The young prophet stayed with the wise men until day turned to dusk. When it was time to leave, she rolled on the ground three times. 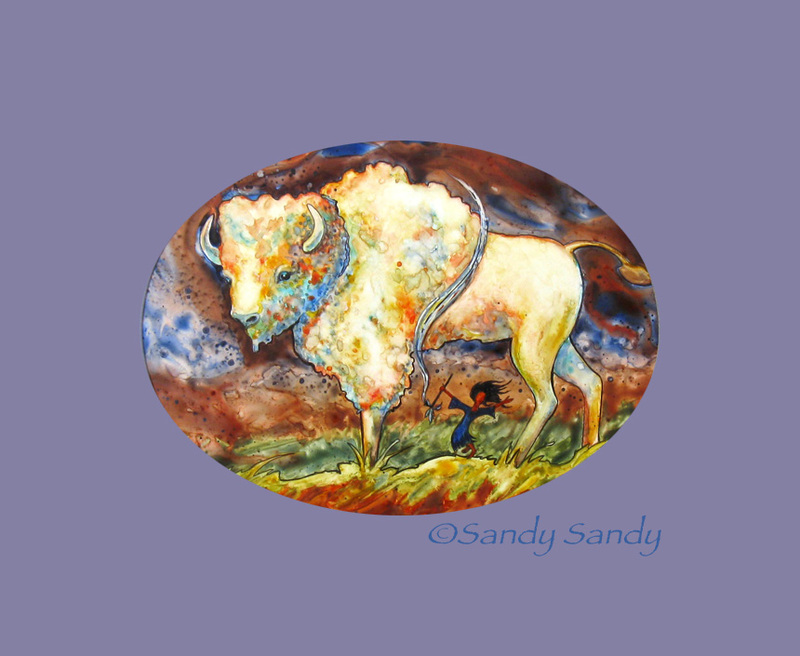 As she rolled, she was transformed into a white buffalo calf! No sooner had the calf disappeared across the horizon when herds of bison started drifting in and grazing all around the outskirts of the Indian camps. Because of White Buffalo Woman, the early Native Americans experienced a time of plenty for many years and women were given a more equal status with men. This is why I like to think of White Buffalo Woman not only as a symbol of thanksgiving, but also as being instrumental to woman kind's liberation and empowerment. Acid-free triple Mat w/ Backing in sleeve - 16" x 20"